China is the world’s fastest-growing major economy, and the nation has been ranked as the world’s second-largest economic power since August 2011. Increases in disposable income and a strong currency have contributed to soaring Chinese tourists across worldwide destinations. Ernst & Young estimates that by 2030, nearly one billion people in China could have a disposable income that allows them to travel abroad at least once a year. Ten years ago the Chinese government singled out tourism as a key pillar of economic growth, which led to development of tourism infrastructure such as high-speed trains, hotel complexes and airports to absorb growth within the middle class. In fact, China is currently busy building nearly 70 airports around the country so that in future no person will be more than a 90-minute drive from an airport. Complementing its domestic tourism, outbound international travel from China is not far behind. The Number of Overseas Trips by Chinese travellers has grown from 10 million in 2000 to 83 million in 2012, a spike of 18% over the previous year. Maintaining identical trends, outbound tourists from China rose to 98 million in 2013, and is expected to reach 114 million (up by 16%) in 2014 according to the China Tourism Academy. In terms of value, Chinese travellers spent a record US$ 102 billion on international tourism in 2012; a 40% jump from 2011- thanks to an appreciating Chinese currency. In fact, overseas tourism spending from China is expected to rise upto US$140 billion by end of 2014. Mainland Chinese are already the single biggest group of tax-free shoppers in the world and experts predict that China will overtake the US in 2027 as the world’s largest travel economy. When it comes to overseas destinations preferred by the travelling Chinese, short haul locations like Thailand, Macau, Hong Kong tops the list while the Americas, Middle East, Europe and Oceania feature prominently among long haul vacations. 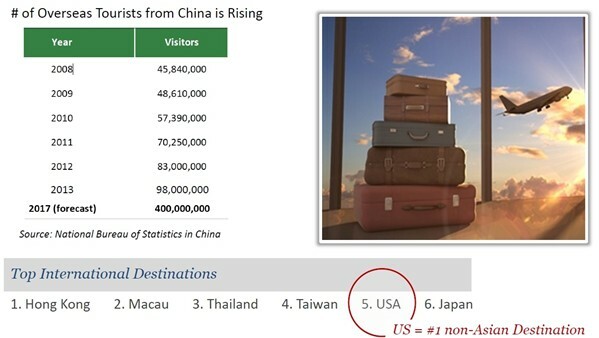 In fact, US represent the most preferred destination for international luxury travel outside Asia, according to China’s leading online travel agencies, and also by the independent think tank- China Outbound Tourism Research Institute.